The Ferret Association of Connecticut works cooperatively with all branches of the Connecticut Humane Society (CHS) as well area Animal Control Officers (ACO’s) and other humane organizations and shelters in the rescue and sheltering of domestic pet ferrets. We have both referred ferrets and owners to CHS for adoptions and surrenders as well as taken ferrets from their facilities when they have been unable to place an animal. We can accept ferrets from humane societies, municipal shelters and ACO’s that do not have the facilities to house ferrets or who are unfamiliar with their needs on a space available basis. We do our best to prioritize emergency situations. If your municipal facility is unfamiliar with ferrets, here is a basic guide. Any humane organization facing a hoarding situation involving ferrets is welcome to contact us. We will work to assist directly and via our network of regional ferret shelters. Outside New England, we urge groups to visit the Ferret Shelters Directory for quick links to local resources. The process is like that for individuals (see Admission Process) though we use an inter-organization rather than ownership transfer form. Because many people do not want to travel to Hartford, we urge shelters to offer local adoption to increase each animal’s chance for a permanent home. To assist shelters and animal control agencies, FACT can offer staff counseling and training on the behavior, care and housing of ferrets. Please contact us if you need to place a ferret or if you would like further information on housing and adopting ferrets through your facility. 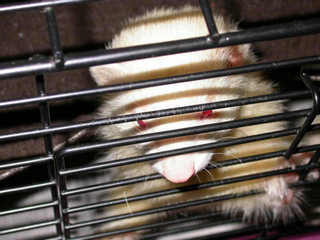 We also urge Animal Control facilities, humane organizations, veterinarians, pet stores and breed rescues who do accept and place ferrets to register at the Ferret Shelters Directory – an international resource project initiated by the Ferret Association of Connecticut to expand the options available to the public in responsibly rehoming and adopting pet ferrets.